Happy Christmas week! I have a bunch of festive polishes to show you throughout this week. I'm going to start with a favorite indie brand of mine for the holiday, Noodles Nail Polish. I can definitely say after seeing all the holiday collections out there, Noodles is my favorite by far. This is a fun crelly polish perfect for Christmas. Believe is a cream colored crelly base with red, gold, green, and gold star glitters. Color: I love Christmas crellies and this one is perfect. I also love this is not a true white crelly. I can find some white crellies to be really harsh on my skin tone, but this more of a cream or off white colored base. I find it more forgiving on my skin. 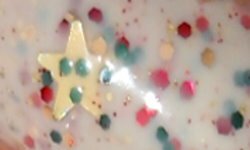 I love the festive colored glitters in this as well as the gold stars. Formula: This had a nice formula. I used 3 coats above. I did not have trouble applying this formula or the small glitters. I will say the gold glitters were not cooperative. They were hard to find in the bottle and when I did find them on I had to place them on my nail. Price: This is $8.50 on Noodles Nail Polish's etsy site. Overall: I really like Believe! I love the off white crelly base and the glitter combination. I do wish the stars were easier to get out and apply. I did not have any trouble with the stars in Winter Wishes, but this one was a bit more troublesome. I think this crelly base is more opaque than Winter Wishes. This still is a great polish to me though. Vote for the Best of 2015!